Male non-employment rates among prime working age Israelis have risen over the past 30 years – tripling among haredi (ultra-Orthodox) and nearly doubling among Israel Arabs and non-haredi Jews. Three decades ago, the rate of non-employment among prime working age (35-54) non-haredi men in Israel was almost identical to the average rate of non-employment among industrialized countries belonging to the OECD (8.47 percent in Israel compared with 8.07 percent in the OECD). Since then (Figure 4), the average rate of non-employment in the OECD grew by about one-half while nearly doubling among non-haredi Jews in Israel. The similarity that existed between Israel and the OECD three decades ago has all but disappeared. Though relatively higher economic growth in Israel in recent years (as a result of an emergence from the deep recession of the past decade) led to recent reductions in Israeli non-employment rates, the rate of non-employment among non-haredi Jewish men (15 percent) was nonetheless about one-fourth higher than in the OECD (12 percent) in 2008. 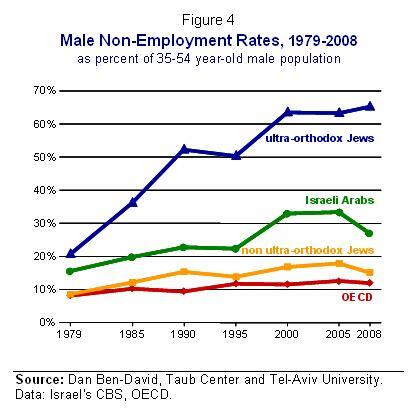 Non-employment among Israeli Arab men grew from 15 percent in 1979 to 27 percent in 2008. Among the haredi males, the rate of non-employment in 2008 (65 percent) was more than three times the rate of no-employment three decades ago (21 percent). The substantial increase in government assistance program over the years has enabled a growing part of Israeli society to choose life styles of non-employment, while multi-year neglect of human capital infrastructures (especially education) and physical infrastructures (especially transportation) prevents many people from obtaining the tools and conditions necessary for coping successfully in a modern and competitive economy. In the case of men with less than 12 years of education, part of the explanation for the increase in non-employment is the economic growth process itself, which has led to an increase in the demand for skilled and educated workers – with a relative drop in demand for unskilled and uneducated workers. About half of Israel’s prime working-age population has no more than 12 years of education. Another part of the explanation for the increase in male non-employment is the marked increase in the import of unskilled and uneducated workers from abroad – to the point that one out of every seven workers in the country’s business sector in 2008 was not Israeli. This has had the effect of crowding out unskilled Israeli’s – in particular, Arab Israeli men – from the employment pool. The issue of education is not just one relating to the quantity of years that each person has gone to school but also to the quality of education provided. As detailed in the Taub Center’s recent State of the Nation Report, and highlighted in the November 2008 Bulletin (“The People of the Book and their Children’s Education”), the level of education in core curriculum subjects in Israel during the past decade has consistently been lower than in each of the 25 main OECD countries. Achievements among Israeli Arab pupils have been even lower still, while haredi pupils do not even study the core curriculum. The very high rates of non-employment among haredi Jewish men, and the fact that these non-employment rates have more than tripled over the past three decades makes this issue unique in a number of ways. Not only are these rates high in comparison to other population groups within Israel, they are also very high compared to haredi Jewish populations abroad. Financial assistance from the government to this group within Israel comes in a myriad of different forms, with many of these not transparent in the government budget. The fact that the majority of prime-working age haredi adults find it possible to choose life-styles of non work – albeit, in poverty – while able to support nearly five times as many children under the age of one as non-haredi Jews (children numbering in the double digits is not an uncommon feature of haredi families in Israel) is indicative of the level of support provided these families. Cutting off much of the support to a society who denies its children an education that would enable them to compete successfully in a modern economy is difficult enough when this group is still a relatively small portion of Israel’s population. However, the gap in population growth rates among the different segments of Israeli society makes this issue much more problematic for the future when its relative size will make it the dominant segment of society – particularly in view of the needs of a modern society for doctors, engineers and scientists, some of the professions that today’s haredi education system has little hope of producing.